Examining and cleaning DSLR camera sensor with VisibleDust technology. What is the difference between the Sensor Brush®, the Sensor Brush® with Spinning Device, and the Arctic Butterfly® (and the Arctic Butterfly® 724 or SL700 for that matter)? All three brushes are built around the SCF technology and are related to each other in the fact that one was the predecessor of the other. The first version on the market from VisibleDust was the Sensor Brush® which was cleaned and recharged by blowing air (via canned air). This posed two problems: a) canned air is not travel friendly (cannot fly with it) and b) that moisture from the canned air would some times blow onto the bristles making them contaminated. After realizing that canned air was not such a good idea, the development team designed the spinning device (SD). The centrifugal force of the SD effectively recharged the bristles and kicked off any residual contaminants, but the Sensor Brush® needed adapters to fit into the device. This method worked great because it offered the convenience of quick cleaning with the ease of portability and ability to travel anywhere. But not to be caught asleep at the wheel, the development team improved on their last creation by inventing the Arctic Butterfly®. With its solid body design the Arctic Butterfly® encompasses everything that the Sensor Brush® with SD provided without the need for adapters and for that matter the Sensor Brush® itself. Today VisibleDust offers two models of the Arctic Butterfly®: the 724 and the SL700. The SL700 is designed as an entry level DSLR cleaning tool for the budget orientated consumer, while the 724 is the standard model that offers a little more bang for your buck. How does the Sensor Brush®/Arctic Butterfly® work? Both the Sensor Brush® and the Arctic Butterfly® are built upon the SCF technology. To summarize, the bristles are constructed to hold a positive charge. The spinning action casts off any neutralizing water particles that have adhered to the bristles, reestablishing the positive charge across the bristles. When the brush is drawn over the sensor, the dust particles are drawn to the positive charges on the bristle, effectively lifting the dust off the sensor onto the brush leaving the sensor dust free. Do I spin the Sensor Brush®/Arctic Butterfly® on the sensor? No. The brush should never be spun on the sensor. The reason for spinning the brush is to re-establish the charge over the bristles and to clean off any residual debris that may have been left after the last cleaning. How do I clean the brush head when it becomes dirty? There are two methods to clean the SCF bristles. 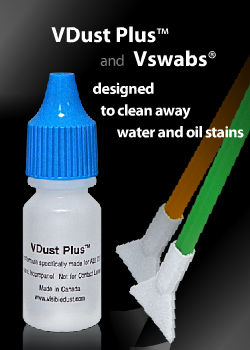 VisibleDust has developed the Sensor Brush Wash™ tablets which are specially ph buffered to avoid extreme acidity or alkalinity while clean contaminants from the bristles. Another way to clean the bristles is by using isopropyl alcohol (70-90%). When the bristles start to fan out or kink, is there a way to straighten them? Yes. Heat distilled water to around 50 degrees Celsius, 120 degrees Fahrenheit and pour into a clean cup. Dip the bristles into the water for a few seconds and remove. Let it air dry (if you spin it at this moment, the bristles will fan out and you will need to start all over). Can I use the Sensor Brush®/Arctic Butterfly® to clean my lenses? Yes. But there is a down side. You will find that you will be cleaning your brush heads more frequently because of a higher contamination rate (i.e. oils from fingers on the lens that get onto the bristles). It is recommended to use a micro-fiber cloth to clean your lens instead.